Schimpf is putting up some of the most lopsided offensive numbers seen around the league. He has a team-leading 14 home runs, but is hitting just .168 on the year. The Padres’ starting third baseman has a total of 26 walks, which equals his total of hits on the year. Schimpf has 10 singles on the year, which is four less than his home run total. Although Ryan Schimpf has a 0.8 WAR, and leads the team with 14 home runs, he gets a “C” grade with his sub .200 batting average, and 62 strikeouts on the year. Some more lopsided statistics about Schimpf are that he homers every 11 at-bats, strikes out at a 33.3 percent rate, and walks at a 14 percent rate. Schimpf may be able to hit 30-40 home runs on the year, but an average below .200 can’t be overlooked long-term. The Padres’ opening day starter has been very hot and cold all year long. The right-hander has posted a 5.77 ERA and a 4-4 record. On multiple occasions this season, Chacin has followed up a gem with a very poor performance. On April 19, Chacin pitched eight scoreless frames against the Diamondbacks. Five days later, he pitched against the Diamondbacks again, giving up seven earned runs in six innings pitched. In May, Chacin pitched seven strong innings against the Brewers, striking out eight and allowing just one earned run. His next start against the Mets, Chacin didn’t get out of the first inning, allowing seven runs, while only recording two outs. If Chacin can gain some consistency, his grade should raise throughout the season. The Padres closer has struggled in the early part of the season, posting a 5.73 ERA and blowing two saves. Maurer has had success converting eight of his ten save opportunities on the season. It seems as though Maurer is putting his struggles behind him recently, with three straight dominant appearances in the closing role. He hasn’t allowed a hit over those three appearances, while successfully recording three saves. 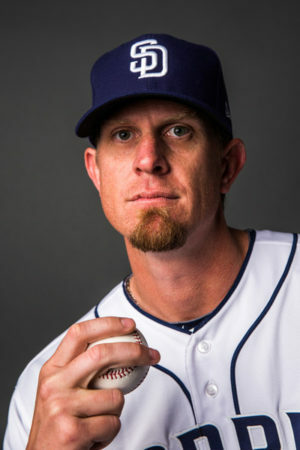 Andy Green used Brad Hand in two straight closing situations after Maurer’s struggles, which may have motivated the right-hander to turn it around. The set-up man has a record of 3-2 and an ERA of 3.00 in 2017. Buchter hasn’t matched his dominance of last season so far, and has even looked shaky at times on the mound. Overall though, Buchter has been a solid option from the bullpen, but there is still room for improvement. 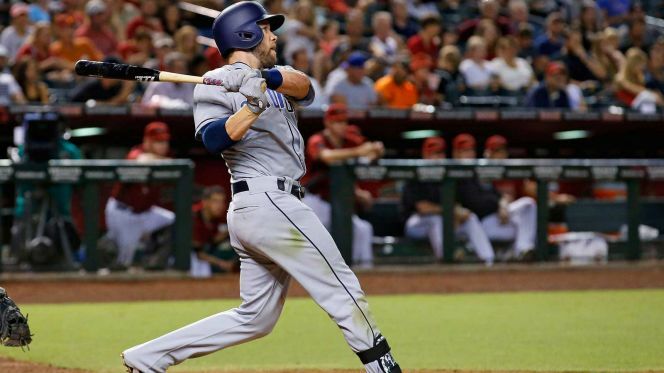 The infielder, who is one of the most popular Padres, received a much-deserved contract in the off-season when he signed a deal for two-years/$7.5 million (2017-18) with a 2019-2020 team option. Solarte switched positions to 2nd base in 2017, and has fared decent defensively there. Yangervis started the season hot, but has hit a prolonged cold streak, dropping his numbers to a .251 batting average and a -0.3 WAR, although he has managed to hit in the clutch with 25 RBI and get on base with 21 walks. Solarte also avoids striking out with only 23 so far this year. Solarte’s charismatic attitude on the field realistically should give him an A or B grade, but his performance has been moderately below what is expected. Prior to this season, Stammen hadn’t played a full season in MLB since 2014 with the Washington Nationals. In 2017, Stammen has been used as a long reliever for the Padres, posting a 5.02 ERA. Stammen has appeared in 17 games, pitching 28 2/3 innings. Stammen struggled in April, giving up 11 runs over 10 innings, allowing opponents to hit .340. In May, Stammen pitched much better, holding opponents to a .185 batting average, while posting a 2.65 ERA for the month. The long reliever receives a “C” for now, although he certainly is trending upwards. The speedy outfielder was placed on the disabled list early on in the season with a foot injury. On May 15, X-rays revealed a fracture in his right foot that will sideline him an additional six weeks. In the small sample of Jankowski’s 2017 season, he has struggled at the plate, hitting only .160 and striking out 21 times over 50 at-bats. His defense remained dominant, but the lefty looked lost at the plate. Hopefully once he returns from injury, he can return to his 2016 form. The veteran signed with the Padres late in the ’17 off-season. The longtime Angel has struggled with his new team. Over nine starts this season, Weaver posted a -1.3 WAR, 7.44 ERA, and an 0-5 record. It is safe to say Weaver has not been good this year. His average velocity on his two-seam fastball this year is logged at 83.46 mph, well below the MLB average. His 16 home runs allowed over 42.1 innings pitched is more than likely a result of his declining velocity. Padres Executive Chairman, Ron Fowler, made a comment during an interview with The Mighty 1090-AM that Weaver was on a “short leash”, indicating a roster decision could be made after Weaver’s next start. The veteran responded with six strong innings of one-run ball against the White Sox. However, Weaver landed on the disabled list after his next start on May 19th, where he surrendered seven earned runs in the first inning. 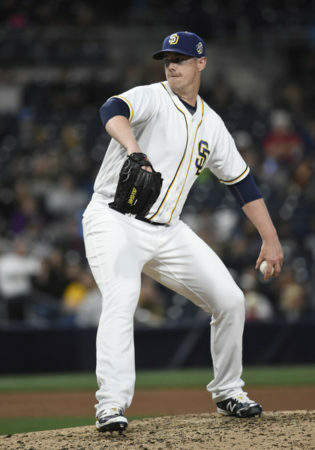 As much as the Friar faithful wanted to see the likable Weaver succeed, there isn’t much room on a major league team with his performance in 2017. The Padres called up Dinelson Lamet, who has been stellar in his first two major league starts, picking up a win and striking out eight in both outings, while posting a 2.70 ERA collectively. He is making a case for a permanent rotation spot with the Padres. The Padres pitching has not been good in 2017. They rank 24th in MLB with a 4.60 ERA and have surrendered the fourth-most walks in baseball with 193. These rankings could be much worse, if it wasn’t for the bullpen. Critics blasted the Padres’ starting rotation prior to the start of the season, labeling them as the worst in baseball. They have certainly performed better than expectations, but not good enough to get out of the “C” range. The Padres’ offense ranks dead last or near the bottom in almost all offensive categories this year. Their .221 average is 30th in MLB, while they rank 28th in runs scored, and 29th in OPS (.657) and OBP (.288). The team has the third-most strikeouts with 496. Yuck. On the minuscule bright side, the Padres have hit 62 home runs, which is on pace to blow away their previous record of home runs in a season. Even then, there are more home runs being hit than ever in baseball. The Padres were expected to be aggressive and speedy on the basepaths in 2017. At times they’ve looked very sloppy running the bases though, by being picked off or caught in pickles constantly. They have stolen 29 bases, good enough for 11th in MLB, but have been caught stealing 12 times. Their 70 percent success rate is decent, but they are not fully reaching their potential. The Padres’ defense has committed the eighth-most errors in baseball with 37. They also rank 20th in fielding percentage at .982 and 18th in defensive efficiency rating at .690. They have looked marvelous at times turning double-plays, making diving catches, and throwing rockets from the outfield. Other times they have looked clueless by making fundamental mistakes. The start of the 2017 season has had its ups and downs, but has gone parallel with expectations for the most part. There have been some very pleasant surprises as well as disappointing performances. It is clear it is going to be a long season, filled with more “checks” in the loss column than wins, but 2017 has been an exciting one so far to say the least. We have already witnessed the franchise’s second ever cycle, a 21-year-old Rule-5 selection hitting around .300 while batting lead-off, and even a sweep of the defending World Series champs. 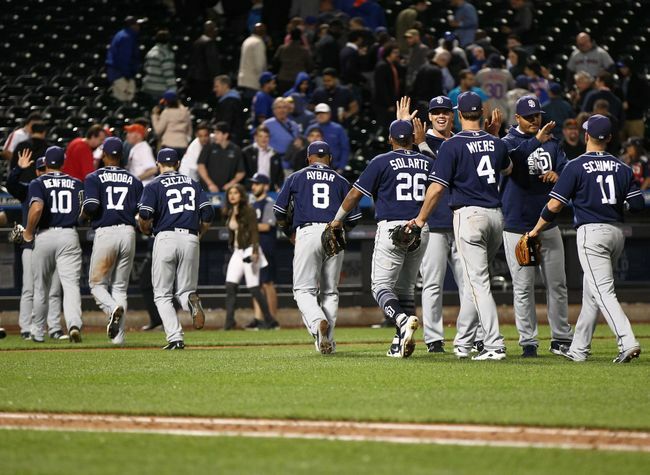 It is enjoyable watching the youngsters perform well at the big league level, and die-hard fans can all agree that the Padres’ 2017 season seems like a step in the right direction.